It all starts with an ambulance and a need for really bright emergency lights. This is in Mexico so a three thousand dollar Federal Signal or Code 3 light bar is out of the question. I have to use the existing incandescent light bar and convert it. I've resolved the 30 watt,36 volt LED chip heatsink issue. But I need to strobe 36 volt chips with a 12 volt source. Ignition to conventional LED strobe controller for strobe trigger control. Strobe controller powers (2) 40-amp 60-volt rated solid state DC/DC relays for control circuit. 600-watt DC to DC booster to change strobed 12 volt signal to 36 volts (strobed). I am working with a lot of unknown material. Can the commercial solid-state relays amplify a 60 Hz strobe effectively? (b) multiplexing the led's in rotation? 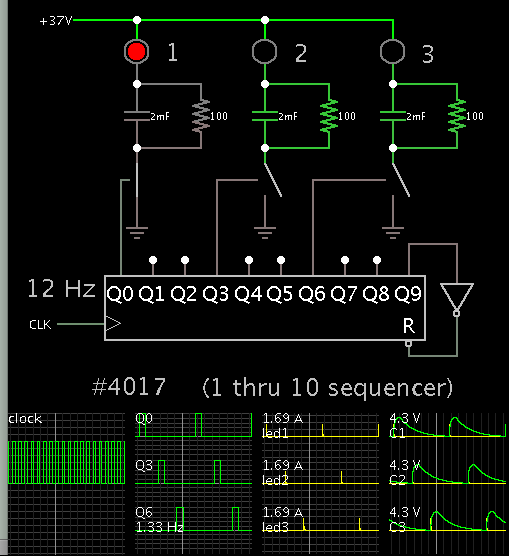 An easy way to do item B is to use a 4017 IC (1-through-10 sequencer). 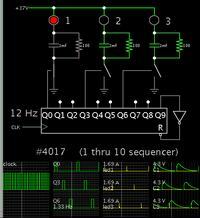 It rotates a clock signal through 10 output pins. Your led draws 1A at 36V. It might require 30V to turn on. Suppose you put a capacitor in series. It will pass full current to light the led brightly for a fraction of a second. When the capacitor has acquired a few volts of charge, the led drops below 30V and goes dim. This is the brief strobe effect. The flash captures the eye's attention, while drawing minimal power. During idle time, a resistor discharges the capacitor. It must drop the capacitor back to 0V, to fully reset the capacitor. Of course you would replace the switches with transistors/ mosfets.